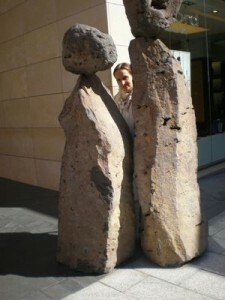 But on my way back from attending the Doha Tribeca Film Festival, I decided it was high time I visited Beirut. After watching Ahmed Ahmed’s hilarious documentary Just Like Us where he says “What happens in Beirut, ends up the next day on Facebook” and hearing from more than one chic acquaintance that the city is indeed a hub for fashionistas and gourmands the world over, I itched to visit and finally meet my mysterious editors in the process. What awaited me was a city with a pulse all its own, a mecca of fashion, food and fun, with a following as diverse as famous writers -- Miral writer Rula Jebreal confessed to me that she adores the city -- and beloved film stars -- Cairo Time star Alexander Siddig urged me to visit the very oddly shaped Yabani, a Japanese restaurant with average food but great people watching. BTW, if you look hard enough at this photo of Yabani at right, you’ll see that next to this posh establishment is a shelled out building, with no facade. 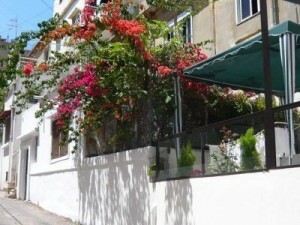 THAT is the exact contradictory charm of Beirut which is so undeniably fascinating. 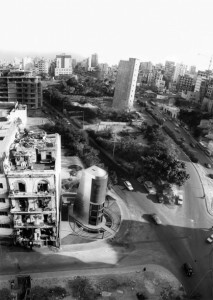 Beirut is also a series of contradictions, like the posh new buildings of Achrafieh, with Bougainvillea growing down manicured terraces, flanked on each side by the bombed out shells of Beirut’s fighting past. It is flamboyant handsome soldiers in Centre Ville dressed in head to toe army gear, smoking a cigarette and checking out the pretty girls who shop at the super-expensive Beirut Souks. It is streets of absolutely stand-still traffic and then, around the corner, no cars at all. It is gourmet hummus, grilled halloumi cheese with mint and fresh, steaming hot pita I would pay an arm and a leg for in NYC, which can be found at the food court in a mall and eaten alfresco in the warm November air. Beirut turned out to be the most inspiring, happening and creative place I have ever visited and that’s really saying a lot, considering it has to compete with Bombay, Marrakesh, Rome and Istanbul. The true beauty of Beirut lies in its people. From the elder gentlemen chivalrously helping me to cross the street, if they ever saw me standing for more than one second at the non-functional traffic lights, to the waiters in Cafe Blanc who insisted on bringing all kinds of after-lunch goodies “on the house” -- BTW, the place is named after a deliciously traditional hot tisane made with flower essences and yes, they brought that too for me to try. From the endless kind Beirutis I stopped to ask for directions on my walk from Achrafieh to Centre Ville -- much longer than 15 minutes, which is the time/distance ratio everyone will tell you in Beirut, no matter if you are going to the other side of town, or just around the corner -- to the Palestinian children in front of Costa Coffee who engaged me in an entire conversation, not speaking a word of English. Communicating by signs and hand gestures is not exclusive to the Italians, it appears. Finally, Beirut is not just Hezbollah, fears of impending UN tribunals tipping the balance of peace and odd political allegiances. 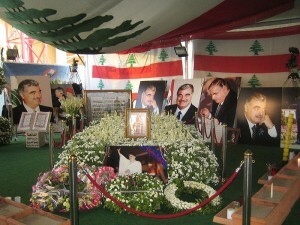 Even if the primarily Christian neighborhood of Verdun bewilderingly flaunts poster of Hezbollah Secretary General Sayyed Hasan Nasrallah on every building, I stumbled on the imposing Rafic Hariri shrine on my way to shopping at the glamorous Beirut Souks -- the area he fought hard to revamp -- and was saluted by life-sized images of Mahmoud Ahmadinejad flanking both sides of the road while in my departure taxi, just feet away from Hariri International Airport. While my driver blasted Amr Diab’s Tamally Maak and winked at me sweetly from his seat. So, while I do urge all who have a chance to visit this magical city, when traveling to Beirut leave your common sense at home -- you really won’t need it, Beirutis will take great care of you -- and don’t forget to pack your sense of humor, your joie-de-vivre and your wallet… You’ll need money for the fabulous shopping! 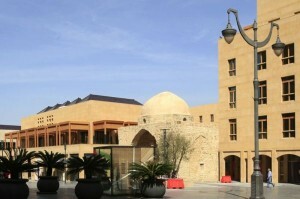 For more info on hotels and sights, check out TravelToLebanon.com. This entry was posted on Wednesday, December 8th, 2010 at 2:34 pm and is filed under Adventures. « Black Swan – Not Your Mother’s Tchaikovsky!